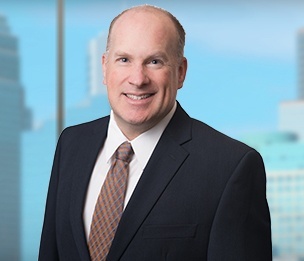 Steve Hennessy is a senior attorney in Dykema's Minneapolis office where his practice focuses on patent litigation and prosecution. He is experienced in all aspects of patent litigation and drafts and prosecutes U.S. patent applications and coordinates foreign patent prosecution. Mr. Hennessy has a strong background in material sciences, chemistry, automotive transmissions, heat treatment processes, water filtration, pipes and pipelines for coal, gas, oil, and power plants, laboratory equipment, and complex industrial processes. He has assisted clients in the preparation and prosecution of patent applications in the areas of medical devices, electromechanical devices, electronic smoking devices, audio speakers, fire protection materials, additive manufacturing processes, business methods, inventory control systems, and financial payment systems.